This article is about British edition. For American edition, see LEGO Club Magazine January - February 2011 (US). 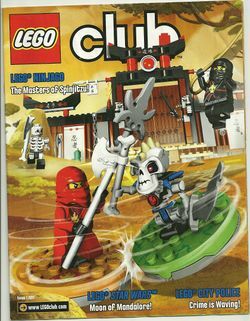 LEGO Club Magazine Issue 1 2011 is the first LEGO Club Magazine released in January 2011. The Mummy is Back with Ramses Return! - 3855 Ramses Return feature, including an history of hieroglyphics and a code to crack. Max's Adventures - Max tries to be a ninja. Lessons of the Dojo! - a guide on how to become a ninja. Spinning to Win! - a guide to Spinjitzu. To Enter Atlantis! - Help the Atlantis team by solving a code. The Big Crime Wave! - A City Police comic. Watch out for the Death Watch! - A scene using 7914 Mandalorian Battle Pack and 7913 Clone Trooper Battle Pack. Log Cabin Maze! - Help the man get down the river to his Log Cabin. LEGO Universe News Network! - An update on the LEGO Universe game. Minifigures All Around Town! - The latest sixteen minifigures have joined the neighbourhood. Build the Crimson Comet! - A link to the LEGO Club website, for instructions on how to combine sets 8227 and 8228 to make another racer. LEGO Star Wars III: The Clone Wars advertisement. LEGO Club Updates! - A contest to enter, information on an newsletter, terms and conditions, and a guide to what is in the March edition. Pursuit by Sea! - Find the items listed to help the police catch the crook. Facts about "LEGO Club Magazine Issue 1 2011 (UK)"
This page was last edited on 8 September 2014, at 12:14.